Townsends is a fully integrated, large bird poultry processor that sold nearly 700 million pounds of poultry products and generated approximately $500 million in revenue during 2010. From its corporate headquarters in Georgetown, DE and processing facilities in Batesville, AR and Siler City, Mocksville and Pittsboro, NC, the Company serves its domestic and international customer base in several niche market segments such as antibiotic-free, organic, ethnic, par-fried and fully-cooked poultry lines. Townsends’ products are sold under the following brand names: Chef’s Select, Perfect Breast, Pristine Cuisine, Ruby Dragon, Speedy Bird and Townsend. The Company performed profitably for much of 2010 as a new management team implemented a comprehensive operational improvement program. However, beginning in the summer of 2010, the prices of corn and soybean, which are the main inputs used for chicken feed, rose dramatically including an almost 100% increase in the price of corn from July 2010 to February 2011. In addition, industry overcapacity precluded any pass-through of these higher input costs to customers. 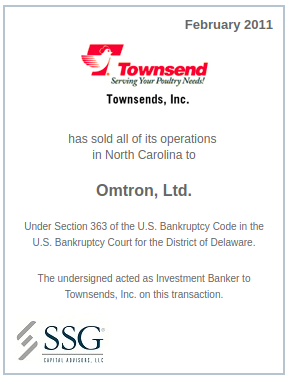 Townsends filed for relief under Chapter 11 in the U. S. Bankruptcy Court for the District of Delaware on December 19, 2010. During Townsends’ Chapter 11 proceeding, SSG marketed the Company to a wide range of domestic and foreign strategic buyers as well as financial buyers. SSG delivered a stalking horse bidder for the Arkansas operations and produced multiple bidders for both the Arkansas and North Carolina operations, including two large foreign strategic buyers, culminating in an all-night 363 auction with robust bidding. Peco Foods, Inc., a domestic competitor, acquired the Company’s Arkansas operations and Omtron, Ltd., an affiliate of a Ukrainian agricultural conglomerate, acquired the Company’s North Carolina operations. The combined, final purchase price of just over $76 million was approximately $30 million in excess of the stalking horse bid. The transaction closed on February 25, 2011 and over 3000 jobs in Arkansas, North Carolina and Delaware were preserved.